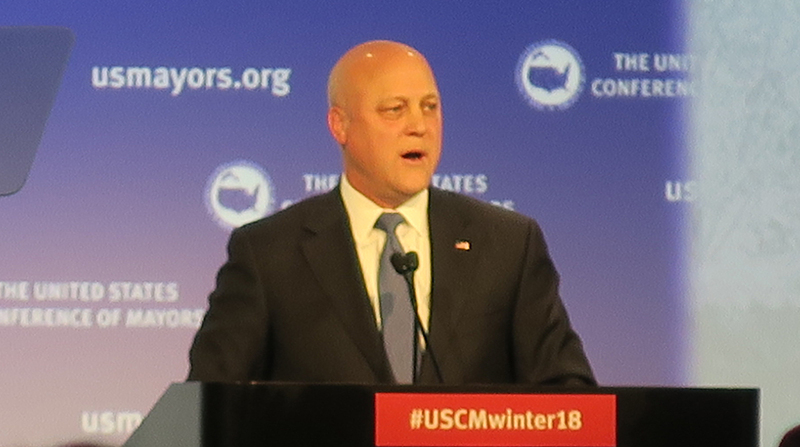 WASHINGTON — Mayors must take the lead if they hope to improve their cities’ infrastructure, with the help of federal partners, New Orleans Mayor Mitch Landrieu said. Infrastructure funding is important because metropolitan populations will grow by 24% over the next 30 years, placing more strain on roads and bridges, Landrieu added. He issued the call to action at the U.S. Conference of Mayors’ winter meeting here Jan. 24. The group’s gathering came a week before President Donald Trump was to unveil his long-awaited infrastructure plan. According to Landrieu, the United States faces a $4.6 trillion infrastructure deficit that makes the country uncompetitive with other nations. All of the mayors were expecting to meet with the president, but many boycotted after the Department of Justice on Jan. 24 increased pressure on “sanctuary cities” seeking public safety grant money, warning that they could be legally forced to prove they are cooperating with federal immigration authorities. Trump had been touting a 10-year, $1 trillion infrastructure plan, explaining that $200 billion would come from existing federal accounts, while the remaining $800 billion will come from private-sector investments. Chicago Mayor Rahm Emanuel flatly said that the infrastructure plan does not supply enough funds for states hoping to conduct infrastructure projects. Emanuel, who previously was chief of staff for former President Barack Obama, expressed skepticism that the upcoming plan will be effective. “Two hundred billion, for a trillion-dollar goal, is fairy dust. The emperor wears no clothes when it comes to his plan,” Emanuel said.” He and Landrieu were among mayors to boycott meeting with Trump. Landrieu said that, more than anything, he hopes the infrastructure plan is functional and works for cities and local jurisdictions. He said the nation’s roads, bridges and airports need a lot of help and that mayors are eager to engage with White House officials on this issue. Sen. Tim Scott (R-S.C) underscored the importance of infrastructure, saying that states need sufficient funds to support their systems. “In order for us to deal with infrastructure needs around the country, we’re going to need more money than we’ve ever had,” he said, noting that it took him 33 minutes to get some 3 miles from his office to meeting site. “When I was a younger man, I could have run that,” he quipped.